Do white rappers benefit from 'white privilege'? If you're trying to get your head around the subtleties of racism in America in 2016, you might not look to a white rapper for words of wisdom. But the artist Macklemore has offered them all the same. Not surprisingly, he's divided opinion online quite sharply. Criticism of white acts that find stardom by "appropriating" black culture is at least as old as Elvis or Vanilla Ice. In his latest track Macklemore explores those criticisms head on, agonising over his own position in this complicated cultural debate. White Privilege II is an earnest take on the problems facing the black community, the Black Lives Matter movement, and his role as a white musician who rose to fame in a musical genre created by black musicians. Perhaps to mark it out as something from the heart, Macklemore has made the nine minute track available for free on iTunes. Macklemore's no stranger to speaking out on behalf of minorities to which he doesn't belong. As the title suggests, he wrote another song about white privilege back in 2005. And in 2012 the straight rapper wrote one of his best known songs, Same Love, in support of gay marriage. In the first verse of White Privilege II he talks about feeling awkward when attending a Black Lives Matter march. He says his own skin colour means he faces fewer obstacles than black rappers. Indeed, when Macklemore beat Kendrick Lamar to win the Grammy award for Best Rap Album in 2014, some commentators attributed the victory to race. The rapper even felt compelled to apologise to Lamar for his win in a text message that he later posted publicly. Later in the song he repeats the criticism that he - and others - face, as a white musician profiting from music that originated in the black community. The song has led to a heated debate online. 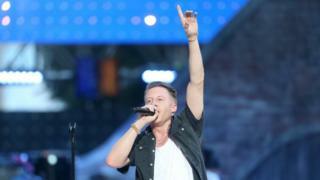 On Twitter alone, Macklemore's name has appeared more than 150,000 times in just three days. And despite its well meaning sentiment, the song has drawn opprobrium from many. Much of the criticism has come from the black community, some of it accuses the rapper of failing to offer any solutions to the problem. For Macklemore to suggest that his rap benefitted from white privilege - by rapping about it - seemed in poor taste to some, who argued that the song simply perpetuated the problem. Join the conversation on this and other stories here. Others accused him of commercial opportunism. Much of the reaction wasn't targeted at Macklemore himself, but rather the way his contribution had skewed the focus of the conversation. And some pointed out that complained that black rappers had been trying to make the same point for years, but simply hadn't been listened to because their voices didn't carry equal weight. And then there is Iggy Azalea, a white artist accused of "stealing" from black culture, who didn't appreciate being name checked in the song. "He shouldn't have spent the last 3 yrs having friendly convos and taking pictures together at events etc if those were his feelings," she tweeted. But much of the response to White Privilege II has been positive. One prominent activist in the Black Lives Matter movement phoned Macklemore to discuss the song in detail, and later posted his thoughts on Twitter. In a series of posts DeRay McKesson wrote about Macklemore's inspiration for the song (the acquittal of Darren Wilson, a white police officer who shot and killed an unarmed black man in 2014), and his awareness of its inherent problems. Ultimately McKesson appeared to endorse the song, or at least Macklemore's intentions in releasing it, and even pushed back against those who remained sceptical. He echoed a number of other voices in saying that the song wasn't really aimed at the black community, but at other white people. Next story: 'Traditionally submissive Muslim women' say who us?